We prove that, for each nonnegative integer k and each matroid N, if M is a 3-connected matroid containing N as a minor, and the the branch width of M is sufficiently large, then there is a k-element subset X of E(M) such that one of M\X and M/X is 3-connected and contains N as a minor. van Zwam, S.H.M, & Geelen, J. (2011). 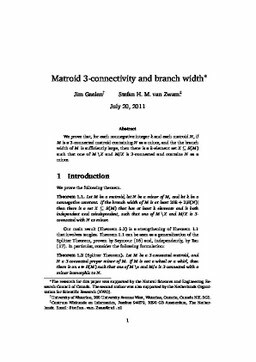 Matroid 3-connectivity and branch width. arXiv.org e-Print archive. Cornell University Library .